This page highlights the telescopes that Bob Bunge has built and uses. See a picture of each below and follow the links to more details for each scope. Over the years, Bob has written many articles about astronomy that have been published here and there. This is "TJ2," Bob and Cathy's 20-inch f/6.4 Telescope. 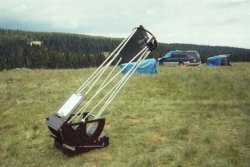 TJ2 is a reflecting telescope. Like most of Bob's telescope, it's a "Newtonian" reflector. That means it uses a mirror, 20-inches in diameter to collect starlight and then focus toward the top of the telescope. At the top of the telescope, a small mirror reflects the light into an eyepiece that allows us to see whatever the telescope is pointed at. 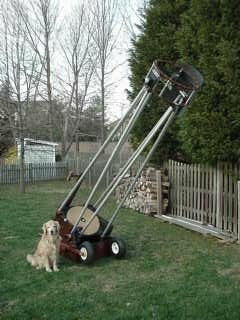 Here Tramp, one of our Golden Retrievers, sits beside the telescope. This is the third physical form this set of optics has had since 1983. Bob refigured TJ's mirror in his basement in 1994. Select this link or the image above to read a history of this telescope and see photos of its travels, development and changes over the years. 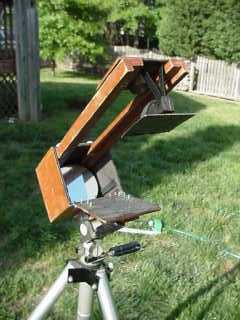 This is "Pringles," Bob's 4.25-inch f/4 Extreme Travel Telescope. Pringles is a very compact, very inexpensive travel telescope that Bob built while in the Navy on an Aircraft Carrier. It's been around the world a few times. An Ultra small 6-inch f/5 RFT built by Bob in 1982/3 while on the aircraft carrier USS America. The mirror was ground on the ship and the scope later made trips to the Indian Ocean and observed the southern skies. It's also travelled to an eclipse of the sun. Its compact design actually predates the Pringles scope above. This scope doesn't have a name. Bob just calls it "the four." It's a small reflector that is designed only to look at the planets, specificly Mars. It's Bob's most used telescope. This scope is called "Ellie" because Bob built to travel to the Table Mountain Star Party in 2001, which is near Ellensburg, Washington. 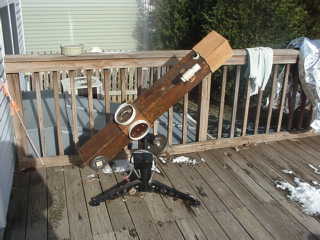 It survived the trip with flying colors and is a nice telescope. It folds up to fit in a suitcase that can be checked on an airplane. It uses homemade optics and just about everything else. This is Bob and his homemade 6-inch refracting telescope. 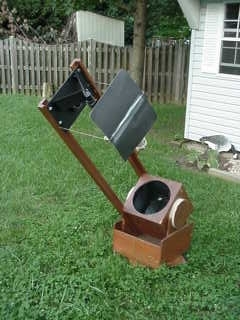 Bob started to build this telescope, which uses a lense 6-inches in diameter to collect light, in 1982. Today, Bob still works on the telescope a few days or weeks a year, but he does use it to observe the Moon and planets even though there is alot he'd like to do to it. 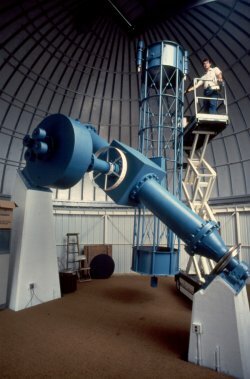 "The Big Blue Beast" at Warren Rupp Observatory. 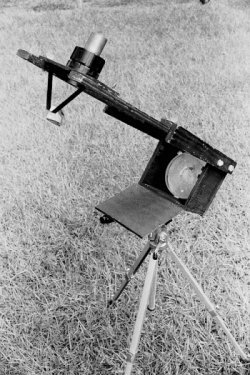 Bob didn't build this scope, but had use of the 31-inch f/7 reflector at Warren Rupp Observatory near Mansfield, Ohio for several years. Built by Bob and Marshal Holman in 1984. It is now owned by Brent Archinal of Flagstaff, Arizona.